The Guardian's 'ursus bogus' moment | Watts Up With That? population estimate, from a study that has not been published anywhere. waiting for it for years, and it’s reported in The Guardian. period. How can science self-correct behaviour like this? I recommend submitting this to be reproduced in the Journal of Irreproducible Results and for a potential Ignoble Award. Mann rose to prominence by supposedly being able to detect “faint” signals using “advanced” statistical methods. Lewandowsky has taken this to a new level: using lew-statistics, lew-scientists can deduce properties of population with no members. They really are desperate to make polar bears a symbol for the climatist cause. The alarmists are getting very sloppy in their desperation – and more visible in their motives. From 5,000 in the late 60s to 25,000 now and the difference was what again? Oh yea we stopped shooting so many. Restrictions on killing the critters worked like a charm. Nothing like cherry picking your end date. 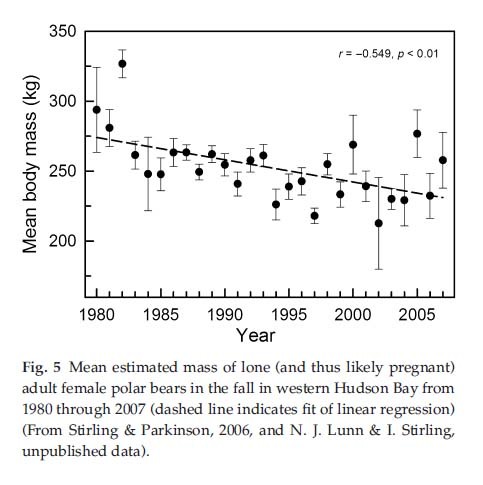 Let’s just ignore the “pause” in polar bear decline after 2004. The 2012 estimate for the same area was 1,013. Hmmm…almost 10% increase in less than a decade. We should be able to extrapolate from there and figure out in what year the polar bear population will exceed the human population world wide. Davis Straight in the 1970’s had less than a thousand bears, now the estimate is more than double that. I recollect that Foxe Basin has also grown about 10% in the last few years. As it hasn’t warmed for 17 years, what is that person talking about? Does he know how to compute a correlation? Does he know that a causation is rather unlikely if there is not even a correlation? As it hasn’t warmed for 17 years, what is that person talking about? Dirk, Dirk, Dirk. Haven’t you been paying attention? The heat is hiding in the places where we can’t measure it, right along with the polar bears we can’t count. The UK Guardian invests the same level of scientific objectivity into its articles as it displays fairness in its moderation of public comment within the Comment Is Free sections. It used to be “liar, liar, pants on fire”. Now it is, “here’s a Phd and a Research Chair”. I don’t know, short of getting the funding cut-off, what are we to do except keep repeating the same old saying. Get the funding cut-off by getting the message to the funding decision-makers that incorrect findings are being funded by their decisions. Time for a “Golden Toady” award? 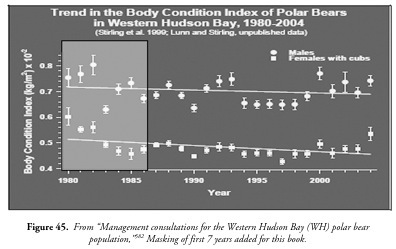 While always referring to published results showing western Hudson Bay polar bears were suffering decreasing body condition (BCI) Stirling and Lunn never published their latest dta showing since that time the body condition had been improving. This parting shot from an entry at the Polar Bear Alley blog demonstrates a similar contempt for the claims of some. “So, as usual, its a complicated reality with polar bears… Either way, we have some glitches and all that but its better to focus on the good news this year: the bears for the most part are out on the ice. For the most part, the bears were in good condition (Manitoba Conservation reported that many of their larger bears were around 150lbs heavier than last year). Of course, others did not fare as well including Dancer and a radio-collared female who was reported to have lost her cub this fall. She was disoriented and wandering down the road, her hormones probably all out of whack. Its tough to see but this is part of nature. Still, these last two season have really put an exclamation mark on what all of the local polar bear guys believe up here: we have not reached a ‘tipping point’ with Churchill’s polar bears, they are not starving, the numbers are not crashing and it is not necessary to remove them from the wild and place them in captivity. So yeah, if I have an ‘agenda’… well, that’s it. Boy, no one mention to them that the Manitoba government took three bears from the Churchill area (from the western HB population) to populate the new zoo exhibit in Winnipeg. There’s four bears now, when the exhibit it full there will be about a dozen bears there. Gee, now they can’t publish in peer-reviewed journals which will require data and stuff, because they’ve published it in The Guardian. How unfortunate that there are all these rules against republication. With this seasons Ice recovery the bears are back in favour as they cannot use the Ice extent for funding purposes. If I may draw an analogy. In Pattaya there are Tshirts proclaiming..No Money, No Honey. Same with Climate ‘science’ No Honey ie desired proclamations, No Funding. It has warmed a lot in Eastern Canada over the last 17 years … if you lived here you would know that. Question is … how long will this last … this years ice looks like its forming faster! A strategic move to spike a logical looking export plan for Alberta oil sands product? Bypass the American blockade with a short 1200Km pipeline to Churchill? I feel the same about The Guardian and a couple of other formerly more or less trusted news sources – but then I remember how long I have been seriously viewing a broader range of news sources on the internet. It’s pretty much the same period. Is it that my original news sources have got worse or is it that I now have regular access to information which shows them up as being often egregiously flawed, trivial and/or biased? Of course, it is probably a bit of both. Sounds like a variant of science by press release. Sales pitch science. Marketed for the masses! My Grandpappy always said “you believe what newspapers say until they write about something you know about”. AGW promotion depends on conclusions based on studies with 0 evidence. It is a clear demonstration of the sublime nature of the AGW true believers. “The heat is hiding in the places where we can’t measure it, right along with the polar bears we can’t count. Now I’m confused. Is the heat hiding in the polar bears or in the ice? Seems there are far too many polar bears as well as not enough of them. “…it is certainly a truth that computer modelling is dependent on whatever data is used which is why the science is peer reviewed so all facts and figures are checked and re-checked before publication. That way nothing gets in the way of facts but updated facts. With believers such as this pushing the pro-AGW barrow, ‘scientists’ who allow their data-free comments to be published in the MSM are reinforcing the thoughtless acolytes’ adherence to the climate change meme. Unfortunately, a majority of modern science could be submitted to that journal. Back when ClimateGate happened, the defense from the alarmists was to say “this is how science is done.” Sadly, they were right about that. @artwest. Same here. For those of us that take nothing on belief, the internet provides better access to information than anyone could have ever predicted. This hyper-abundance of information is also why those that take everything on belief find the internet is a source of confusion. “Who can you believe?” they keep asking me. N-O O-N-E, people, no one. There is no reason to believe anyone. Spot the difference? Goldberg takes the care to remove the numbers from the graph. This is what scientists often call a “sociologists graph”. Without the numbered scale there is a rhetorical suggestion that the bottom is zero. The drop looks far more dramatic like that. Now this is not unintentional. You don’t prepare a graphic like that , publish it in newspaper and then go “opps! I appear to missed the numbers off”. No , this is deliberate propaganda and Goldberg is a specialist of misrepresenting science. The heat is hiding in the places where we can’t measure it, right along with the polar bears we can’t count. They are growing gills, now? So they have not weighed them, have not got close enough to tell whether they ARE pregnant, so what is all this based on? Apparently eye-balling them from a safe distance with binoculars and guessing their body weight. This must be great, end-of-year game in Churchill. GUESS THE POLAR BEAR’S WEIGHT AND WIN A SNOW EQUIPPED S.U.V. !!! I bet if they sold loto tickets they could raise lots of money to help fight global warming. (Mind you if I lived in Churchill I may not be too set against the prospect of a bit of warming). Kudos to Dr Susan Crockford for highlighting yet more bad practice and propaganda. The other question this all raises in the total absence of any REAL data, is what are the numbers of sightings used in these estimations? In view of the last polar bear research fiasco, which apparently was all spun out of the spotting of one dead bear from an aeroplane flight and then spinning it into a projection of arctic wide population decline, we are going to look a bit carefully about any such claims from now on. There ought to be a means of prosecuting those who put out or publish press releases containing false information simply to support a personal agenda. We can refute their arguments with true facts as much as we like through these blogs, but in spite of The Guardians lowering standards of journalism, the fact remains that a lot of people still read the paper, and even objective readers will be convinced by the message that the article sends out,no matter how false its contents, and before long we will all be hearing statements from friends and innocent casual observers “but why are the polar bears declining if ther is no global warming” Thus, the false arguments of the AGW nutters are strengthened to the detriment of the well argued sceptic viewpoint. I thought I would look and see how comments where trending on the article and surprise … They don’t have comments turned on for it. Imagine that. Wow, most likely Polar Bear scientists saw a far more serious lack off grant money on the horizon as a far more of a threat to their cushy megastar climate scientist lifestyle. I wonder what’s in that green bubble we will all find out when it bursts. Polar bear populations are easy to determine using this simple formula; count their noses and divide by one. It helps if you put a little dot of fluorescent orange paint on each nose you count to avoid double-counting. The advantages of this system is that it is very accurate and it requires a large number of polar bear researchers, so there will be plenty of employment opportunities in this field. The only drawback I see is that careers are typically very short. P.S. If you’re looking for that missing heat, check the polar bears’ pockets. Might as well frisk them for contraband heat as long as you’re painting their nose. The continuation of these activists existence on the public payroll, says nothing good about our policy makers. Kleptocracy comes to mind, not sober assessment of the facts and public interest. CAGW is a creation of bureaucrats. Nice idea, but given the port is only functional for about 1/3-1/4 of the year, it’s not really practical. Grain only ships out of there for about 8 or so weeks, maybe a little more. Part of that is a function of harvest being in late summer (August) but part of it is the danger of ice along the route. Given the biggest danger to polar bear cubs are adult male polar bears , so to save the cute little ones you have to deal with the 300 pound killing machine which is there only predator. Anyone who thinks otherwise hates small polar bears , and probable puppy dogs, and are clearly not thinking of the children. Actually the greatest danger to the entire polar bear population was a man with a rifle. Since we have stopped shooting polar bears, they are doing quite well. Around our house when something disappears we have a standard answer “it’s probably in a safe place” and when they magically reappears weeks later the book was thinner and wallet is empty, sounds alot like this “study” of the Hudson Bay, (hey, but then maybe they were doing a study to discover The Hudson Bay COMPANY, that sadly has disappeared from said area. In the 1960s I used to read the old Manchester Guardian. It was a fine newspaper. Last FridayI saw a copy of the Guardian that included a replica of the coverage of the assasination of President Kennedy – with excellent articles at the time by Alastair Cooke who was their main US correspondent plus the likes of Norman Shrapnel and Hella Pick. Today’s Guardian “journalists” are dwarves by comparison. But the Guardian is dangerous – it has a miniscule number of daily purchasers for the paper, but it is the house gospel for the BBC which dominates UK news supply. The BBC and the Guardian are in lock-step in their false coverage of climate issues. I pray for the day when the BBC and its $6 billion licence tax is cut down to size – and the day when the Guardian finally folds under its heavy financial losses. Polar bears are still hunted in the Arctic! – Very true and as long as mommy is around the males will not risk it. They might be bigger but the aren’t stupid. – There is but it is heavily restricted unlike what it was in the 1960s when levels dropped to 5,000 and are now at 25,000 (aprox on both). “In Canada the hunting and harvest of polar bears is restricted to Aboriginal people or sport hunters guided by Aboriginal people who harvest by traditional means” – In this context I think “traditional” means dogsled and not snowmobiles. You don’t want to be out there with a bow, arrows and spears (unless you have serious thrill issues). Does it ever occur to these “researchers” that capturing, knocking out, and placing a radio collar on an animal might negatively affect It? Does he know that a correlation is rather unlikely if there is not even a causation? Polar bear populations are a sensitive topic for the Canadian government, which has faced international criticism for its policies on climate change and for allowing limited hunting of bears, mainly by indigenous communities…. ….for example, has shrunk by nearly 10% to 850 bears in under a decade, according to the latest Canadian government estimate seen by the Guardian…. “You can see their backbones and their hips and shoulder blades when they are moving and they are visibly thin,” said Ian Stirling, a wildlife biologist at the University of Alberta, who has studied the population for more than 35 years. OK. No photos of skinny polar bears from Stirling I see. Goldenberg of the Guardian may have let the cat out of the bag in her very first paragraph which mentions ‘limiting hunting’, and how do they keep track of any illegal hunting? What about polluting contaminants, disease, migration? Here is the 1974 1975 starvation event in the Beaufort Sea caused by TOO MUCH ICE! Sometimes estimates can be waaaaaay off and require a little revision upwards (or downwards). It’s good to see Goldenberg lays such weight behind these unpublished guesstimates. “It surprised us that we approximately doubled the population estimate,” said Peter Fretwell, a scientist with the British Antarctic Survey and lead author of a paper published today in the journal PLoS One. Tell it to my brother who lives near Montreal and can’t find any consistent climate warming. It’s obviously hiding in selected parts of eastern Canada. OTOH it is definitely not hiding in this part of eastern Virginia where temperatures are at or below levels of thirty years ago. Look at the data for St. John’s, Goose Bay and Iqaluit! Not sure it fits. It looks a different category to me, this does not “first make people laugh” and then “make them think”. Hm, ok, we can debate on this actually. This science by press release has a different effect. It is trying to bully people with things presented as science. A paper without raw data and clear description of methodology is not a scientific paper. It qualifies for “the science” not science. under guidance of “the science”, where we, the stupid sinners, must march on and flagellate ourselves for the foregivens of our sins and do so reparations. For years, my father read Time magazine. This was from the forties through the eighties. Because of this, I was a long time reader of Time. Until I began to notice they got their facts wrong when writing on topics I knew something about. Usually not out and out lies, but enough twisting to give a false impression of the topic. So I quit reading Time magazine. Haven’t cracked a copy in decades. Couldn’t count on it to give me enough factual information to form a legitimate opinion. For the same reason I had to quit reading Scientific American. It really should be renamed Politically Correct American. Sorry to say, SA out and out lied about matters. It just broke my heart because I loved to go to the library and read the latest copies through the sixties. Some of the older issues are still fun to read.